Imagine being one small part, a word, of a story…Now imagine your skin being part of a global story. This is what SKIN is. 2003 – Shelley Jackson came up with this idea to craft a new medium for story. She would write the 2095 word story and then request volunteers to have one word of the story tattooed on their bodies. Each person would be given a word by Shelley and would then need to tattoo this word on their body. Once accepted as a WORD each volunteer would then receive the complete story. The provision being that they would keep this story forever confidential. I love the idea of this project on so many levels. I love the exclusivity of the story only being made available to 2095 people. I love the secrecy and the intimacy of tattooing a story one word at a time on different people around the world. I love the idea of being a WORD in a story in both a figurative and a literal sense. Tattooing is an ancient art form. I have always been fascinated by the whole process of tattooing. Why they get a tattoo? Where they choose to be tattooed? Tattooing is one of the most intimate experiences. I have long been fascinated with tattoos and I have been designing my “dream” tattoos for years now. I have not yet found the perfect tattoo that I would want inked on me permanently yet so the search continues. But a tattoo is so much more than a symbol or a fashion accessory, in many cultures it is an integral part of the culture’s history and spiritual practices. Tattooing is a bizarrely intimate ritual: a ritual where a person literally carves a symbol, words or an image into your skin with permanent ink. As a writer alone this bizarre ritual where blood and ink are fused together into a permanent “stain” sparks my imagination. This long-held personal fascination with tattoos and the desire to seek out their history in different cultures sparked the idea behind The Tattooist my current WIP. Would you get/Do you gave a tattoo? Do you prefer Literary (words/quotes/mantras) tattoos or image tattoos? Would you be a WORD for Shelley Jackson’s SKIN project? Previous Post Last Words | Who Are You? I love tattoos. I would be interested in being part of Shelley’s word project. 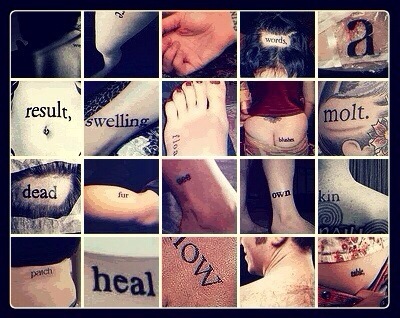 Tattoos are quite fascinating on so many levels. I tend towards images but words can be fun too. I like something that can be many things, symbolic, depicted simply or ornately: stars, compasses, patterns, animals, obscure and archaic, as well as brash and poppy. Fascinating blog you have here. I look forward to perusing it and discovering small astounding surprises. Thanks for stopping by Whole in the Head. Happy Poetry Month! Fascinating. I think I would probably be part of this project. Be kind of cool. I do have a few tattoos. My first was a skeletal joker on an old fashioned bike (with the big front wheel) from a deck of Liquid Blue Grateful Dead cards, with the embellishment of the joker escaping a circus. The next one was of my own design of a celtic-esque dragon in the middle of a circle of flames being blown out by the dragon. Then another of my creations of a celtic-knot shamrock with my last name. I too would take part in this project. I love the idea of being part of a story literally. I also love the secretiveness. It is a fascinating project. I don’t have any tattoos yet only because I can’t decide what to have tattooed. It is a serious question of what you will have on your body until you die (unless you have it removed, of course. Ouch, from what I hear). But if you think of your body as an artistic tapestry, not everything has to be a masterpiece. With my first tattoo, the escaping from the circus was added later as an afterthought by the artist/acquaintance of mine (who is a whole different story). The whole thing is probably twenty years old, and is probably my least favorite of the three. It has faded over the years. I think I might like to get the joker touched up at some point, but I’m going to let the setting fade into… well, the background. Yes I completely see the artistic tapestry aspect of it. I have thought of tattooing some lines of my poetry or my fiction. In terms of images though I would probably tattoo something surreal – Salvador Dali-esque – than something realistic. I still will get a tattoo especially since I am now writing a series about tattoos and the strange intimate connection they have for both the tattooist and the person being tattooed. Didn’t know you were working on a story about that. Cool. We should try and Skype sometime and I’ll tell you about the biker artist doing the work for me out of his basement with at least one, if not two dogs you weren’t supposed to move real fast around. Nicest guy in the world, unless you messed with him, I guess. I got the tattoo for not more than a hand shake (and a case of beer). Yes this my current WIP – The Tattooist – the one I am chasing a deadline on for my agent. Ooh yes we so should Skype. Fascinating!